Thanks to ComingSoon.net new set photos have emerged from the set of Captain America: Civil War and not only reveal a first look at Black Panther, but also a possible fight/chase scene. So everything that follows is the sweet borderline between theory and potential minor spoiler, so proceed at your own discretion according to the Topic Titles. 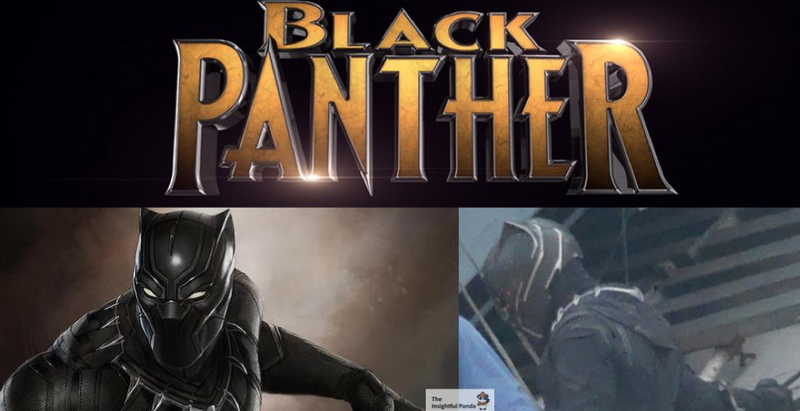 A while ago Marvel gave us some supposed concept art of Black Panther and this suit does look pretty spot on. Remember though that this is his first appearance so whether in graphics department or in his standalone film, we could see the suit get slight detailed upgrades. Though upgrades or not, the suit WILL retain this sleek and streamlined look. Black Panther might not have as much tech as Tony Stark; but the tech he does have is incredibly efficient and is composed of Vibranium. We can already see in this footage some of the Vibranium accents on the suit as well as how it appears that Black Panther will have something closer to a helmet rather than a mask. Though if you look closely there appears to be a hood on the back of the suit. Is this signs of a hood added to the costume for stealth? Is this just some excess detailing fabric? OR is this an instance of added-in ‘bagginess’ to help make all these stunts a little less taxing on the costumes wearer? Remember that the style of movement Black Panther will have to endure in much wider than that of Captain America, Thor, etc. So it would make sense if he had a base running/fighting suit and then another suit for all the wirework stunts. Whatever the case, this suit has the perfect balance of elaborateness and simplicity – and just looks ridiculously badass in the process as well. If we look at the photos closely, we actually see a small narrative pan out. It might only be a few frames, but we definitely see the Black Panther and Winter Soldier stunt doubles interacting in these photos. One moment they’re both on the rooftop, the next Bucky is falling. This ends with Black Panther looking down at him and then leaping downwards in a threatening manner. If Bucky and Black Panther were on the same team – and a villain knocked Bucky aside – then Black Panther would have either stayed and fought OR tried to rescue Bucky. Instead, we see Bucky land well enough on a lower ledge to which Black Panther then pursues. The Black Panther is out for blood and Bucky looks like he’s the target. This certainly lends support to the theories that knowledge of Winter Soldier’s involvement in various deaths – one of which related to Black Panther – would be released to the public in Civil War. Accords (Superhero Registration) or not, Black Panther will most likely remain neutral for the events of Civil War. However, his own mission will pit him and Captain America against each other for a little while. Knowing their respect for each other in the comics, this animosity could eventually be worked out. Either way, it’ll be really fun to see Capt’s expression when he finds Black Panther can match – and scratch – his Vibranium shield.